Undesirable Effects (UDEs) in the Thinking Processes/Logical Thinking Process lingo are effects undesirable in/for a system, a process or its stakeholders and clients. The UDEs are hindrances to better throughput or higher performance, or obstacles to achieving the system’s Goal. In this post I present two “understandings” of the UDEs. The first is ToC’s Thinking Processes, second and later in time UDEs as seen from the Logical Thinking Process perspective. UDEs are hindrances to better throughput or performance, limiting the system’s throughput or performance at large. UDEs can be obvious problems or malfunctions. UDEs are generally well-known by people they concern, thus these people can express and list them easily. What is not so easy is to identify the root cause of all evil. Theory of Constraints assumes that most Undesirable Effects are the visible effects of a unique or a small number of root causes, the constraints; If the constraint can be identified and eliminated, all related UDEs will disappear. Therefore it is meaningful to focus all energy and limited resources to identify and eliminate* the constraint. *When the constraint is a physical bottleneck, eliminating may not be possible. We speak about “elevating” the constraint in this case, meaning better using the available limited capacity and/or recovering wasted capacity and/or gaining additional capacity. UDEs are stated in full sentences in present tense and written in rounded square boxes. UDEs are the “leafs” of a Current Reality Tree, which describes all UDEs and their relationships, down to a common critical root cause or more likely a small number of critical root causes. The Logical Thinking Process (LTP) is a latter development by Bill Dettmer. From his experience with the Thinking Processes, Bill redefined (refocused) Undesirable Effects as undesirable for the system as a whole. In other words an Undesirable Effect is harming the system, like preventing it to achieve its Goal or limiting the system’s performance. If stated UDEs do not harm the system, they are things that people do not like but are nothing the system would have to care about. 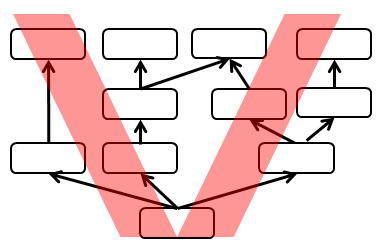 Bill Dettmer is also critical about the V shape stating that most of the problems can be related to a core root cause at the bottom of the V. From his extensive experience, he says that reality proved different many times but because of the V shape dogma, many Toc Thinking Processes practitioners are contriving the logic to fit the model instead of analyzing in a real logical mode. ← What is a Current Reality Tree?